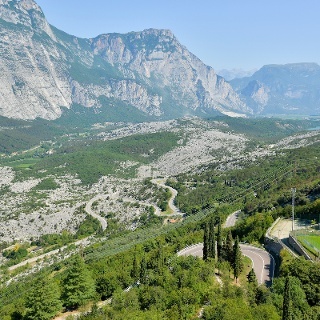 Itinerary along the cycle path which links Vallagarina (in particular, Mori ) to Torbole sul Garda: an easy route and one of the most popular in Trentino. 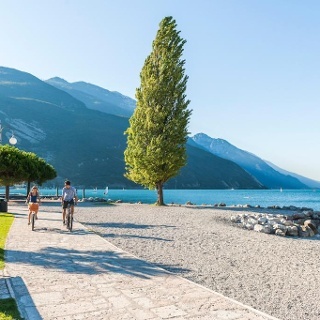 The Mori-Torbole sul Garda cycle path is a branch of the cycle path which goes from the Brennero to Verona, the “cycle path of the sun” (Ciclopista del Sole), the Italian part of a European project which aims to build a cycle path from the North Pole to Malta. Don't forget your camera. The view of Lake Garda from the “old Nago” is truly spectacular! The cycle pathe in Trentino are usually closed by the local authorities from November, 15th to April, 15th. Exceptions are the cycle paths along the River Adige and in the Basso Sarca/Garda Trentino, where cycling is prohibited only in case of ice or during a snowfall. On the stretch from Loppio to Nago, the cycle path follows the old MAR (Mori – Arco – Riva) railway track which was active from the turn of the twentieth century to the nineteen thirties. Lake Loppio is actually the lake that isn't there. Following the work on the Adige – Garda tunnel (a water conduit to be used if the river floods to detour the waters towards Lake Garda), the lake emptied and became, over time, the largest marshland area in all of Trentino. Today it is a biotope, a protected area, because of the particular environment which developed in the area. There is also the archaeological area situated on the island of Sant'Andrea, which can be accessed by means of the cycle path. This route begins shortly after the bridge over the River Adige beside the signpost for Lake Garda which marks the start of the cycle path. Once you leave the Adige cycle path you head down a side road with little traffic and a short uphill stretch. Follow the directions for the cycle path, cross through Mori, and you soon come to the cycle path which continues on towards Lake Garda. The cycle path is paved and protected and the only traffic allowed is for the local farmers. On the stretch from Mori to Loppio the cycle path is completely flat as it runs through vineyards. When you come to Loppio, cross the main road using the underpass and cycle parallel to it for a while. Keep on straight until you come to Lake Loppio. Cycle along the shore of the lake and you come to a short uphill stretch which takes you to the San Giovanni Pass, the highest point (and most challenging section) of the entire trail. From here you start to descend, always following directions for the cycle path, and you soon come to Nago. This is where the cycle path ends. Cycle across the town to the other side. On the right turn onto the “old Nago”, a long straight road which takes you to Torbole and the end of the itinerary. Mori can be reached by train (Mori station on the regional train lines or else Rovereto for the long distance trains) as well as by provincial bus lines. Mori is easily accessible from the Rovereto Sud - Lago di Garda Nord exit on the motorway Autostrada del Brennero A22 (in the direction of Riva del Garda). 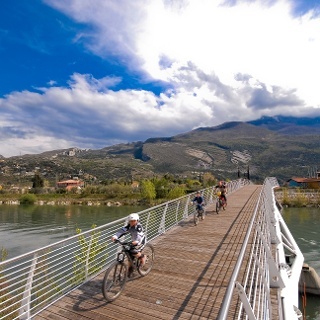 For directions on how to reach the Mori-Lake Garda cycle path by bicycle from Rovereto we recommend the cycling map from the tourist board of Rovereto.